Anastassia Ferdman is no stranger to adventure. She’s completed the Inca Trail and many Algonquin multi-day hikes, so choosing to scale Kilimanjaro and raise funds for Canadian Feed The Children at the same time seemed like a perfect next step for her. 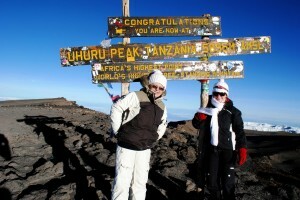 Anastassia and her mother at the top of Mount Kilimanjaro. Inspired by her boss, who climbed Mount Kilimanjaro at the age of 68, Anastassia set her sights on a summit trip of her own. “He told me how he raised money for charity while training for the climb, and it sounded exciting and really challenging. I was really inspired by what he told me, and I thought to myself, this is something I want to do,” Anastassia says. “None of my previous experiences compared to the difficulty of Kilimanjaro,” she says. 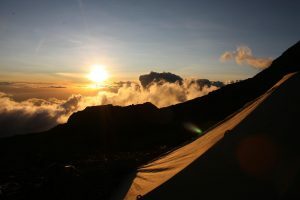 After landing in Tanzania on November 6, she and her mother, who joined her on the adventure, began the challenging trek up Mount Kilimanjaro the next day. “It lasted seven days, with six full days on the mountain. We slowly climbed up each day, with one day reserved as an acclimatization day,” Anastassia says. A striking view of Kilimanjaro. In preparing for the trip, Anastassia visited The Travel Clinic run by Dr. Mark Wise, former Board Chair of CFTC. He suggested that she select Canadian Feed The Children as her charity of choice. “Whenever I visited his website, I would see mention of Canadian Feed The Children and when I checked out the website and did some research, I thought CFTC sounded like a really great organization. I loved that it is a Canadian organization and focuses on helping children affected by poverty,” she explains. Fundraising with her mother, they completed the fundraising in less than three months, raising $2,646, $400 more than their target. “It was through our workplaces that we received the most support right away. My mom and I both sent an email out to our contacts at work with the information of what we were doing and what their donation would be going towards. We included links to the CFTC website and our fundraising page. The response from our coworkers was incredible,” she said. Once the initial donations slowed down, Anastassia decided to throw a dinner party “at my house, as a fundraiser, so all of my friends that came over donated towards our goal,” she says. Community fundraising is a great way to get your networks involved, and while Anastassia is a structural engineer, she also teaches yoga in Toronto and decided to get them involved as well. “I did a couple of classes there, one was a karma class, so it was off the schedule and people could come in and just pay five dollars and do a class, so whatever was raised from that also went towards CFTC and our community fundraising goal,” Anastassia explains. 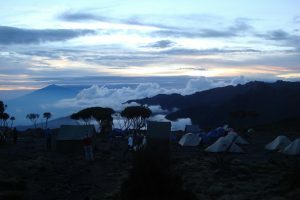 The group camps each night during the trek. 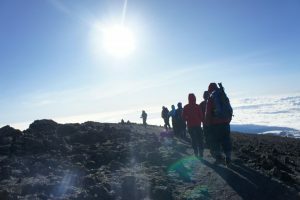 The fundraising Anastassia and her mother did for CFTC had more of an impact on Anastassia while she was climbing Mount Kilimanjaro than she originally expected. “It is definitely one of those things that gives you more motivation when you’re doing the climb. On the last day when we were summiting and it was one of the most difficult days of my life, one of the things that kept me going and kept pushing me on was the fact that there were so many people that had donated, and were supporting me and really hoping to see me succeed. If not for them I might have given up at that point,” she admits. “I believe this whole experience makes a person stronger. It was so challenging, and there were moments where you think you are going to break and give up, but somehow you continue to push through. And when you actually make it, it’s an incredible feeling,” she said. “And when you raise money for charity it doesn’t feel like you are only doing this for yourself. It feels like you are sharing this growth with other people, with the people that supported you,” she said. 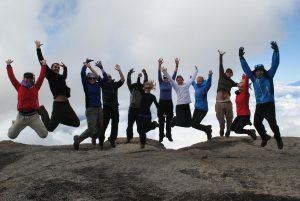 The entire group reaches the summit. Anastassia is off on another adventure in just a few short weeks and CFTC wishes her good luck in her travels. Her courage and sense of adventure is inspiring, and we hope she inspires others to take on challenges of their own.